On 13 November 2018, as part of Talk Money Week, the APPG Debt and Personal Finance held a reception with universities, charities and money advisers to discuss the financial pressures facing students. The event considered new research for the Money Advice Service by the National Association of Student Money Advisers (NASMA) on the student experience of money at college or university. Yvonne Fovargue MP introduced the event, saying how NASMA’s research provides grounds for concern over student finances, as well as grounds for hope. The research shows a significant minority of students, around one in five, are struggling with their finances. Of those who have gone overdrawn, 40% had used an unauthorised overdraft leading to additional charges. But there are also major positives: around three-fifths of students were found to be working to a budget, putting to bed stereotypes about students living a charmed, care-free life. 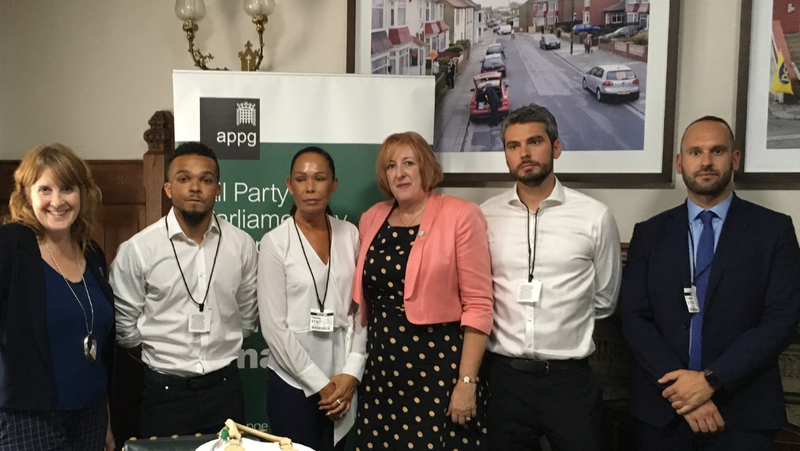 On Wednesday 17 July, the APPG Debt and Personal Finance discussed the need for fundamental bailiff reform at a special event with the family of Jerome Rogers. The event preceded the BBC1 broadcast of ‘Killed by my Debt’, which tells Jerome’s tragic story. Jerome’s mother and brother, Tracey and Nat Rogers attended the meeting to describe Jerome’s bailiff ordeal. In just a few short months, two road traffic fines of £65 had escalated to debts of over £1,000 with the involvement of bailiffs. Tracey and Nat explained why they want independent regulation of both bailiffs and bailiff firms. Jerome had continuously asked to set up an affordable payment plan, but like many, his requests were refused. In Jerome’s case, bailiff administration and visit fees were levied twice, despite the fact the debts should have been treated as one. Moreover, the bailiff had clamped Jerome’s moped, despite it being a ‘tool of the trade’, and falling short of the £1,350 threshold value. Government guidelines were not being adequately enforced. Joe Bullman, the director of ‘ Killed by my Debt’, and the film’s producer, Laura McCutheon, explained why Jerome’s story is so important. Councils passed more than 2.3 million debts to private bailiffs in 2017. With more and more people struggling to get by, uncontrolled bailiff practices are affecting a growing number of people. Four big firms make up 80% of the market, yet individual bailiffs are paid on commission basis. So from their point of view, bailiffs aren’t able to eat or pay their rent if they don’t collect fast. Joe and Laura were concerned about perverse incentives across the industry. They personally hoped that telling Jerome’s story would increase the pressure for much-needed change. Sarah Jones MP has been championing the family’s cause and described the difficulties they’d had in trying to secure justice. Sarah said that the current bailiffs complaint process is incredibly complex to navigate. She spoke of the need for an independent regulator that covers bailiffs used by central, regional and local government. Some councils are moving away from using bailiffs and this should be encouraged. But fundamentally, MPs from all parties needed to come together with the Rogers family to campaign for independent regulation to stop cases like Jerome’s from ever happening again. Matt Upton, representing the Taking Control coalition of 11 national advice organisations campaigning for bailiff reform, described the wider picture and how reforms meant to control aggressive bailiff behaviour have failed. The number of problems with bailiffs is on the increase, with Citizens Advice reporting a 25% increase since 2014. The systematic problems with the bailiff industry are helping no-one, not the state, not bailiffs, not councils and not individuals in debt. The Taking Control coalition believes the time has come for the Government to change its policy of allowing bailiffs to regulate themselves and to introduce a properly resourced independent regulator. Yvonne Fovargue MP, Chair of the APPG, agreed there needs to be an independent regulator for bailiffs to stamp out the threats, intimidation and other bad behaviours that are all too common in the bailiff industry. Jerome’s case and the wider evidence from debt advice agencies shows why Ministers need to look afresh at proper controls. Yvonne said she would be working with colleagues after summer recess to secure a debate in Parliament on the issues. Fundamental reforms are needed and the scope of the Government’s forthcoming review must look at the need for an independent regulator, to ensure rules on bailiff behaviour are properly supervised and enforced. On 6 December 2017, the APPG on Debt and Personal Finance and the APPG on Alternative Lending sponsored a roundtable on high cost credit and alternatives with the FCA. The event was open to MPs and Peers only. Christopher Woolard of the FCA, chairing, introduced the discussion. Mr Woolard gave a broad overview of some of the key themes coming out of the regulator’s High Cost Credit review. Mr Woolard said unarranged overdraft charges are a significant concern: charges are high, complex and highly concentrated. He added that tackling these charges will be a ‘huge chunk of what we’ve got to do in this space’. Mr Woolard said the FCA also has particular concerns about rent to own, home-collected credit and catalogue credit. The regulator will look at multiple and repeat use of different products and more closely at how high cost credit contributes to long-term indebtedness. Julian Knight MP said the FCA should focus on two key areas, namely rent to own and bank overdraft charges. Overdrafts had flown ‘under the radar’ for too long, yet charges for unarranged overdrafts are often more expensive than a payday loan. High overdraft balances and persistent charges were almost impossible to escape. Mr Knight said the banks should have a responsibility to help people out of a cycle of debt rather than sending them deeper into crisis with extortionate charges. Yvonne Fovargue MP agreed: more than half of the charges garnered by banks from unauthorised charges are concentrated in around 2 per cent of accounts and stronger action is needed across all high cost credit markets. Ms Fovargue said the FCA’s cap on payday loans has protected borrowers from spiralling debts. High cost borrowers are often walking a financial tightrope and Ms Fovargue said the cap on the total cost of payday loans should be extended across all high cost credit products so that consumers who are financially vulnerable have a clear safety net to rely on. Turning to affordable credit, Mr Woolard said the FCA is leading a discussion on how to improve access to lower-cost alternative lending. This includes looking at the needs of credit unions and Community Development Finance Institutions. Baroness Tyler questioned why the UK lagged behind other countries in developing a thriving social lending sector. Mr Woolard said that for many alternative lenders, the key difficulty has been scaling up. Several reasons have been suggested, most notably difficulties accessing capital at a reasonable cost; and accessing capital that covers first losses. Baroness Altmann highlighted the development of employer-related schemes for short-term, low-cost credit deals for employees. This includes payroll loans providers such as Salary Finance and Neyber. Anneliese Dodds MP sounded a note of caution if this implied employers having access to whether an employee was behind on a loan or not. Ms Dodds said more should be done to support credit unions. Mr Woolard concluded by saying that a particular area the FCA is looking at is on clarifying requirements around credit broking. This might help more social landlords to be confident in advocating lower cost alternatives to their tenants. On 28 November 2017, the APPG brought together Ministers, creditors and representatives of debt advice agencies for discussion on the creation of the new Single Financial Guidance Body and the future funding of debt advice. Guy Opperman MP, Minister for Pensions and Financial Inclusion explained the creation of the SFGB through the Financial Guidance and Claims Bill merges the Money Advice Service, the Pensions Advisory Service and Pension Wise all under one roof. As well as this, the Government is empowering the SFGB to develop a national strategy to improve peoples’ financial capability and their ability to manage debt, with the SFGB overseeing delivery of this strategy. Baroness Buscombe, Minister at the DWP said the Government is using the FG&C Bill to introduce a Breathing Space scheme to give people a safer way to deal with their debts. This enacts a manifesto pledge and follows a campaign supported by charities and debt advice agencies. The Bill empowers the Government to make regulations to implement Breathing Space once it has received advice from the new body. Peter Wyman CBE explained he had been commissioned by the Debt Advice Steering Group, a group of money advice and creditor organisations chaired by MAS, to carry out a review into debt advice funding, which he said had three main parts. The first key aspect of the review is to forecast the likely level of demand for free debt advice over the next three years. The second is to make recommendations on how debt advice should be funded in the future. And the third is to make recommendations on how to improve the overall quality and effectiveness of debt advice. Mr Wyman said his review welcomed feedback from all parties on his call for evidence. In response, Francis McGee, Director of External Affairs at StepChange Debt Charity, outlined some of the various pressures on debt advice. Firstly, demand for services is outstripping capacity, and secondly, the sector faces increased costs from increasingly complex client circumstances and an enhanced focus on excellence. These factors would need to be taken into account when thinking about future funding. Mr McGee added that in view of the pattern of client debts, it would be important for new sectors, notably the public sector, to increase their funding contribution. Secretary of the APPG, Paul Blomfield MP asked the Minister to expand on language in the Bill around subcontracting ‘delivery partners’. The Minister offered to clarify that the SFGB would continue to work closely with and contract with third sector agencies. Ed Simpson from the FLA asked why the Government had chosen to enshrine Breathing Space in law before the close of its call for evidence. Baroness Buscombe said the Bill ‘supplements’ the Government’s consultation. Referring to Breathing Space in Scotland, the Minister added that ‘DAS is still not what it could be’ and that the Government was utterly focused on helping people through getting the policy design right. On the issue of debt advice funding, Guy Opperman MP said he had been assured by MAS and the FCA that the level of the levy should sufficient for current needs. However, the Minister added that the Government would look to Peter Wyman’s review for further insight on the level of need for debt advice and the right level and mix of funding. On 13 November 2017, the APPG on Debt and Personal Finance and the APPG on Poverty held a parliamentary reception to launch End Child Poverty’s new report Feeling the Pinch: Furnishing Your Home with Rent-to-own. Yvonne Fovargue MP introduced the report which highlights the experiences of financially vulnerable families with high cost rent to own companies. Laura Rodrigues from StepChange, one of the report’s authors, described how families unable to afford household items outright are forced to rent products like cookers, fridges and washing machines at extortionate rates of interest. Factor in the bundled add-ons and people are typically paying more than three times what the goods cost from a standard high street retailer. Rt Hon Ed Miliband MP criticised rent to own companies for unfairly bundling additional warranties and insurances and their often dubious value. Mr Miliband recognised the FCA has taken some action on rent to own but said ‘tougher action’ is needed to tackle wrongdoing in the sector. 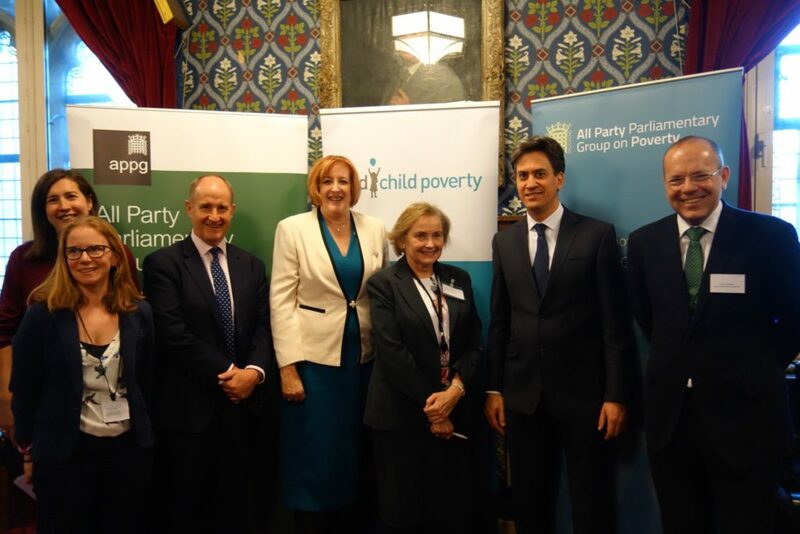 Mr Miliband joined the End Child Poverty coalition in calling for the FCA to bring in a price cap for rent to own. This should encompass the total costs charged for goods as part of an overarching protection against unfair costs. Kevin Hollinrake MP, Chair of the APPG on Poverty, echoed these concerns, pointing out that families who can least afford it are paying a hefty poverty premium. Mr Hollinrake pointed to action the Government has taken on the national living wage to improve household incomes; however he agreed that Government and regulators needed to do more to give low income families a way out of poverty and destitution. Baroness Tyler, Chair of the House of Lords Financial Exclusion Committee called for better alternatives to high cost credit. Her committee had produced a wide-ranging report on these issues and she highlighted strong cross-party support for tackling problems across the high cost credit sector. Christopher Woolard from the Financial Conduct Authority laid out some of the FCA’s main achievements in tackling unfair lending practices since 2014. The FCA has secured £700 million worth of redress for consumers from firms across a number of sectors in the last three and a half years. Most recently, this included a £15 million package for 250,000 customers treated unfairly by the largest retailer in this sector, BrightHouse. Mr Woolard highlighted the FCA’s high cost credit review and said that a rent to own cap would be hard to introduce ‘but not impossible’ and was still something the FCA was looking at. Mr Woolard also raised concerns that the market wasn’t offering low income families more sustainable credit options. Judith Cavanagh from the End Child Poverty Coalition highlighted how the number of children living in poverty is growing. One of the reasons is cuts to vital assistance, including the halving of interest-free credit support provided by the Government’s Social Fund. Ms Cavanagh said this was driving people to dangerous high cost credit and called for MPs and Peers to continue to work with ECP to campaign for important changes on these issues. On 2 November 2016, the APPG brought together council representatives, advice agencies and MPs to discuss how Council Tax debt collection practices can be improved. On 3 March 2016 the APPG held a joint meeting with the APPG on Credit Unions to discuss how the Government can help low income groups to save. On 14 July 2015 the APPG held a Financial Fair, a drop-in event for MPs and Peers to find out more about organisations helping people to manage their money and deal with financial problems. Guests speakers included Treasury Minister Damian Hinds MP and Martin Lewis, Editor of MoneySavingExpert.com.